The many reflections from the ground. 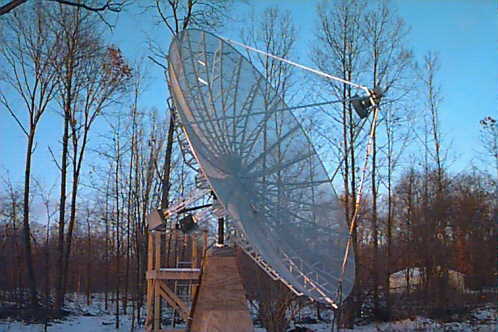 The distorted patterns from the use of helical and dipole antennas. 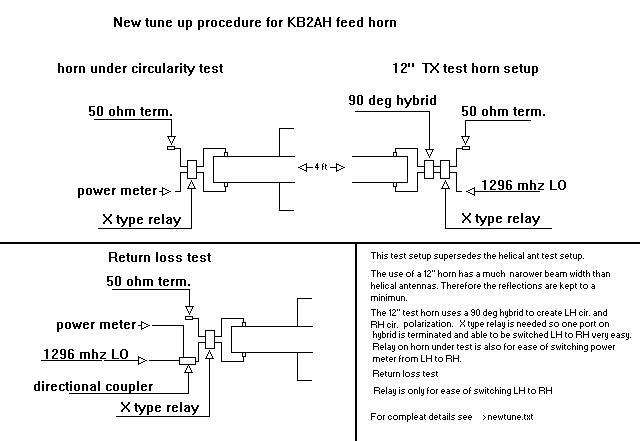 The use of a standard feed horn with vertical and horizontal monopoles fed with a 90 deg hybrid to attain RHC and LHC polarization greatly reduces the inequality and asymmetries of LH and RH homebrew helical antennas. Example. Unless both helical antennas have the exact gain, same ground plain positioning, are perfectly oriented to each other and the ground plane, the rf pattern will be different. This will show up in your tuning procedure. Not all of us have access to a network analyzer, (*see test equipment*) X type relays, 90 deg hybrids known to be good at 1296 MHz, power meters, spare feed horn, and a stable LO with stable output power. But it is nevertheless possible to obtain good results with the simplest of test equipment. Use your exciter with an attenuator. No attenuator: Take a length of RG58, it has large loss at 1296. For those few that have access to a network analyzer I think the horn tune drawing is self explanatory. So I will move on to the next best setup. The relays are not necessary, They merely facilitate the switching back a forth from RHC to LHC, and checking return loss. Set all delay line screw to 1.5 inches in horn. Monopoles are 2.4 inches long #14 wire. First check return loss (RL). Trim monopoles for best RL. If you come up with better than -25 dB that is great. 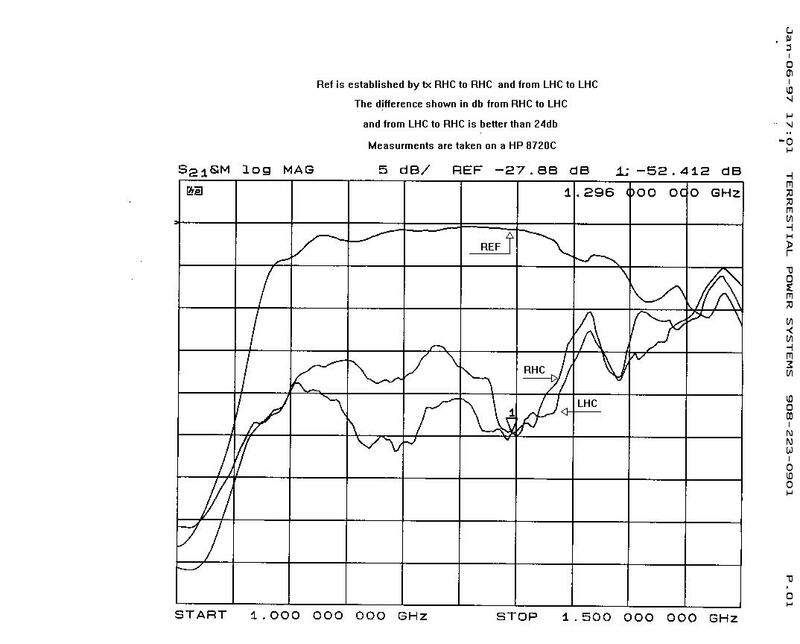 But you have only started and the RL will not stay at -25 dB as tuneup proceeds. Go next to a circularity test. Move power meter power meter to RX LHC HUT, TX RHC TA, tune delay line screws for minimum gain. Should be at least 20dB down from ref. Start from open end moving to short (short is closed end of horn). Turn both pairs equality. But each pair may not be necessarily screwed in the same depth. Switch to RX RHC HUT and TX LHC TA. Adjust tuning same as first circularity test. Keep tuning and checking until you get 20dB down or better on both RHC HUT and LHC HUT and readings are the same. Go back to RL test. Check RL, At this point do not trim monopoles any further, The delay line screws closest to short affect RL dramatically. Tune to bring RL back to as best as you can. Further RL adjustment is to bend monopoles towards the short. But you must keep 75% of the monopole parallel with short. You may have to turn delay line screws to bring horn back to circulatory, but you can again bring RL back to better than -25dB by bending monopoles. When you feel you have done the best you can you can do, perform a linear check. Remove the hybrid, note power meter readings on RHC , LHC. They should be 3dB down from ref. Rotate linear horn slowly, power meter should read 3dB down without much deviation. Check isolation between RHC and LHC, you should find a least 20db. Substituting detector for the power meter for circularity test is certainly possible. But the numbers on your ua meter are only reference numbers. Follow the same procedure as above substituting a detector for a power meter. For RL test, you can use a Bird or equivalent.